​Mason County, WA includes 157.2 miles of Puget Sound's iconic shoreline. Over 38% of Mason County's shoreline is armored overall, and 59% of Mason County's residential shoreline parcels have armor -whether or not it is needed. 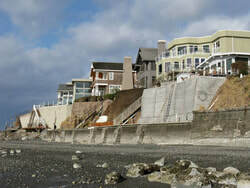 ​Mason County properties represent 15% of shoreline armor Puget-Sound wide. * Despite this challenge, residents are working hard to be stewards of Puget Sound and to care for the waterfront that makes our region of the world so special.